Chakra symbols -- the age-old, meaning-packed images that represent the seven chakras -- are beautiful to behold and contemplate. Each chakra has a distinct symbol associated with it. The chakra symbols can be used individually as mandalas for meditation. While the symbolism of each is deep and complex, you don't need to understand it completely for it to help you focus your energies in support of its associated chakra. There is power in these symbols that does not need and goes far beyond our intellectual understanding. If you're trying to heal, support or cultivate a particular chakra, it also can be helpful to keep the symbol for that chakra near you. For example, you might carry in your pocket a stone with one of the symbols etched into it, wear an item of clothing with one of the symbols embroidered on it, tape a symbol to your bathroom mirror or refrigerator, or simply carry one of symbols printed on paper in your wallet. Creating art incorporating a particular symbol can also be a powerful chakra-healing experience. 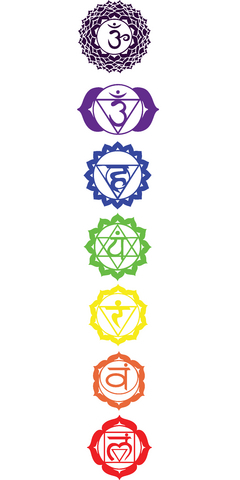 All seven chakra symbols can also be used together for meditation. This can help to balance and integrate the entire chakra system -- the ultimate goal of any chakra work. If you'd like to learn more about chakras and how you can support their health, you may enjoy my book, Chakra Care: Do-It-Yourself Energy Healing for a More Joyful, Loving, Fruitful Life, which I wrote to help people understand the chakras and learn ways that anyone -- not only professional energy healers -- can balance, align and nurture them. This practical, highly readable resource has over 500 down-to-earth activities and exercises. It's is a "just-right" explanation of the chakras for beginners, but it has loads of fresh ideas and perspectives for more experienced energy workers, too. For more information about chakras on this website, you can go to the Chakras main page, where you'll find access to 19 more articles.